7-inch high-resolution intuitive touchscreen controls. Supports optional BlueChart® g2 Vision® HD charts for Auto Guidance and other premium navigation features. Garmin Marine Network and NMEA 2000 Support: Full-network compatibility allows you to add more capabilities to your boat. Garmin Marine Network support allows sharing of sonar, including Panoptix sonar, maps, user data, Garmin radar and IP cameras among multiple units. Plus, there’s NMEA 2000 and NMEA 0183 support for connectivity, including autopilots, digital switching, weather, FUSION-Link, VHF, AIS and other sensors. Built-in ANT® Connectivity: Enjoy built-in ANT wireless connectivity directly to quatix® marine watch, Garmin Nautix™ in-view display, gWind™ Wireless 2 transducer, GNX™ Wind marine instrument and wireless remote controls. Built-in Sonar Capabilities: Right out of the box, you have access to some amazing sonar capabilities; all you add are transducers. Comes with built-in Garmin 1 kW CHIRP sonar and CHIRP ClearVü scanning sonar. It even supports Panoptix all-seeing sonar, premium Garmin sonar modules and a wide range of transducers (sold separately). Heading and Position Refreshed 10 Times per Second: Fast, responsive built-in 10 Hz GPS and GLONASS receiver refreshes your position and heading 10 times each second to make your movement on the screen more fluid. It makes dropping up to 5,000 accurate waypoints — and finding your way back to them — quick and easy. 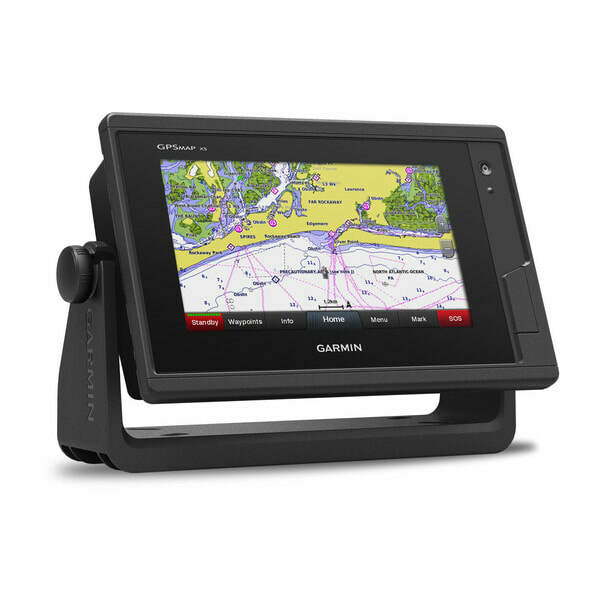 Upgrade to Our Best Maps on the Water: Include expandable memory for accessory map purchases, such as LakeVü HD Ultra with Max Def Lakes or BlueChart g2 Vision HD, which adds Garmin patented Auto Guidance¹ and other great features. Quickdraw Contours to Create Your Own HD Maps: Instantly create personalized HD fishing maps onscreen with 1-foot contours. Tailor them to fit your needs. These are your maps — you own them. Keep the data to yourself, or share it with the Quickdraw Community on Garmin Connect™. Built-in SailAssist Features: To help you gain a wind-maximizing competitive edge, your chartplotter features a pre-race guidance page that shows your virtual starting line along with data fields showing laylines, time to burn before the start and a race timer that can be synchronized across all your networked Garmin GPS products. In addition, other supported sailing features include an enhanced wind rose, heading and course-over-ground lines, set and drift, true and apparent wind data and more. GPX Waypoints Transfer: If you have waypoints, tracks or frequently used routes stored on another manufacturer’s GPS product — or on a Garmin handheld device — it’s easy to transfer those items to your new Garmin chartplotter via industry-standard GPX software formatting.